New Discoveries as New Horizons Flies by Pluto! You may be wondering, what’s the deal with Pluto? First, astronomers demote Pluto’s planetary status in a controversial move, to say the least, and then NASA sends a spacecraft on a mission to observe it in detail? 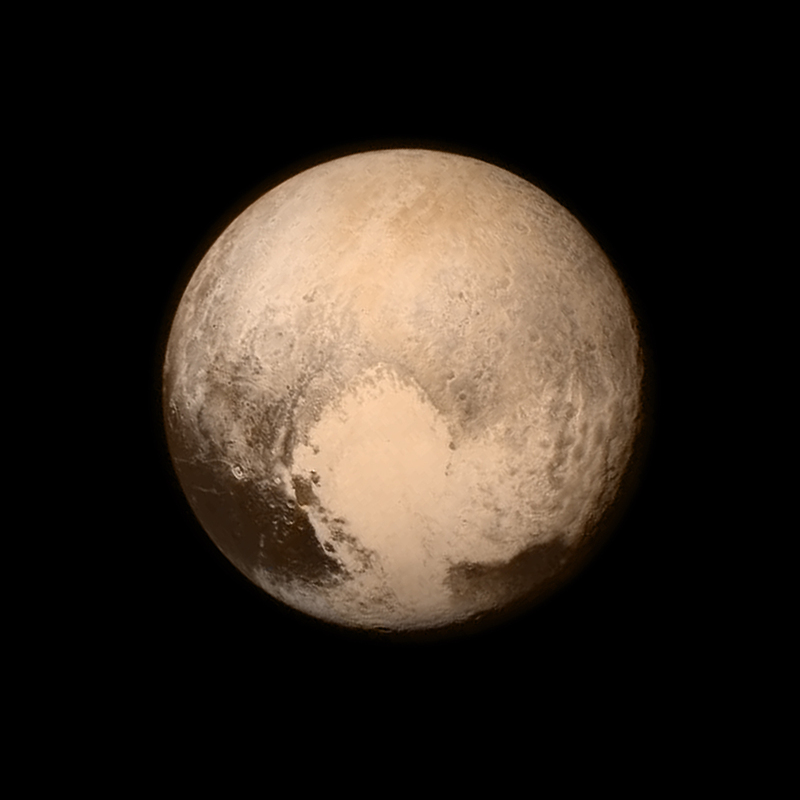 Why is this important, and what could we learn about Pluto that we didn’t know already? Of course, we have quite a bit to learn. Moreover, as one of the least studied objects in the outer regions of our solar system, Pluto is ripe for exploration and investigation. Within a few days, NASA’s New Horizons probe already produced detailed and exquisite photos of Pluto, much better than has been done with Hubble or any other telescope. Its mission is far from over, but it’s already an amazing success and has inspired public interest in space exploration once again. Back in 1930, 85 years ago, a young astronomer by the name of Clyde Tombaugh at Lowell Observatory in Flagstaff, Arizona noticed a distant possibly planet-like object moving across photographic plates. When other astronomers confirmed the discovery, thousands of people suggested names for the planet. In the end, the name that caught on in the community came from an 11-year-old girl in Oxford, Venetia Burney, and the Lowell astronomers approved “Pluto” unanimously. (Contrary to some rumors, she did not name it after the cartoon dog.) Burney (later Phair) lived to witness the launching of New Horizons, but she passed away in 2009. Some of Tombaugh’s ashes are aboard the spacecraft, and his children and grandchildren were present for the events of New Horizons. NASA’s New Horizons spacecraft launched from Cape Canaveral in January 2006. Its journey took it 3 billion miles (about 5 billion km) from Earth, including a slingshot around Jupiter—covering nearly 1 million miles per day!—to reach Pluto. To paraphrase Douglas Adams, you may think it’s a long way to the chemist’s, but that’s just peanuts compared to the distance New Horizons traveled. Principal investigator Alan Stern of the Southwest Research Institute in Boulder, Colorado leads the mission, which also includes a relatively large fraction of women on the team. In another important point, the mission had a relatively small cost ($700M) considering its huge impact on planetary physics, space exploration, and science outreach. As I wrote in a previous post, Pluto has many characteristics, including its small size and mass, that give it a questionable planetary status. It is one of many objects hurtling about the edge of our solar system called the Kuiper Belt, named after Dutch-American astronomer Gerard Kuiper. According to the International Astronomical Union (IAU), these are some of the solar system’s non-planets, ranked by size: Ganymede (Jupiter moon), Titan (Saturn moon), Callisto (Jupiter moon), Io (Jupiter moon), Earth’s moon, Europa (Jupiter moon), Triton (Neptune moon), Pluto, and Eris. Much further down the list comes Ceres (in the asteroid belt between Mars and Jupiter), which is actually smaller than Charon, one of Pluto’s moons. Eris, which was previously known as 2003 UB313 (and also as Planet X, and then Xena, as in the Warrior Princess) is slightly more massive than Pluto. In addition to Pluto, Eris, and Ceres, Haumea (a trans-Neptunian object) and Makemake (another Kuiper Belt object) are the other two dwarf planets the IAU recognizes. In any case, Pluto may be small and may be less unique than we thought and may have an abnormally elliptical orbit, but we all love it anyway. New Horizons made its closest approach on 14 July, Tuesday morning, about 50 years after the first spacecraft landed on Mars, Mariner 4. It will take many months for New Horizons to transmit all of the Pluto flyby data back to Earth, but what has the probe discovered so far? First, New Horizons already obtained the most detailed images of Pluto ever. Second, based on the imagery, astronomers calculated that Pluto is slightly larger than previously thought: it turns out to have a radius 1.9% larger than Eris’s, making it the largest dwarf planet. New Horizons scientists also found that Pluto is icier than previously thought, with its polar ice cap and with icy mountains nearly as high as the Rockies. The ice consists of a frozen mixture of methane, ethane, carbon monoxide and nitrogen—not the sort of thing you’d want to put in a drink. Pluto’s mountains likely formed less than 100 million years ago, which is a relatively short time in the history of a (dwarf) planet. At least some of Pluto’s surface might still be geologically active today—some scientists think they have spotted potential geysers as well—but planetary physicists are not sure about what could have caused this activity. Furthermore, Pluto exhibits very few impact craters from Kuiper belt objects (KBOs), which would also be consistent with recent geological activity. Charon also lacks such craters—a surprising observation considering that it appears to have no atmosphere. Charon’s diameter is over half of Pluto’s, which makes it big enough to cause Pluto to wobble as it orbits. Scientists believe that Charon likely formed from a huge collision with a young Pluto, and debris also settled into Pluto’s four other moons: Nix, Hydra, Kerberos, and Styx. Alternatively, Pluto could have gravitationally captured Charon a few hundred million years ago, which could explain the “tidal interactions” between them. Finally, New Horizons astronomers discovered vast frozen craterless plains in the center of Pluto’s “heart,” which they have informally named the “Tombaugh Regio.” The plains region has a broken surface of irregularly-shaped segments that either may be due to the contraction of surface materials, like when mud dries, or may be the result of convection. The New Horizons team released the following zoom-in images at a press conference today, and we expect more to come. What’s next for New Horizons? The probe continues to send more valuable data from its seven instruments in our general direction. Project scientists will sift through these data to try to learn more about Pluto and Charon’s surface, geology, and atmosphere, and therefore to infer how these interesting objects formed and evolved. In the meantime, New Horizons continues on its merry way throughout the Kuiper Belt. Assuming NASA approves funding for its extended mission, in a couple years it will use its limited fuel to investigate much smaller and newly discovered KBOs, such as 2014 MT69. In any case, we shall keep in touch with New Horizons as it follows the Voyager spacecrafts into the outskirts of our solar system and boldly ventures beyond. ← How Does Pope Francis’s Encyclical Affect the Climate Change Debate?